Go to Elements xii 1: If similar polygons are inscribed in circles, their ratios are as the squares of the diameters of the circles. Theorem 2: Circles are to one another as the squares from the diameters. In the notes, T(AB) is equal to the square on line AB. (diagram 1) Let there be circles, ABGD, EZHQ, and let there be their diameters, BD, ZH. I say that it is: as circle ABGD to circle EZHQ so the square from BD to the square from ZQ. (diagram 2) For if it is not as circle ABGD to EZHQ so the square from BD to that from ZQ, it will be: as that from BD to that from ZQ, so circle ABGD either to some region smaller than circle EZHQ or to a larger. Let it first be to a smaller, S.
This assumption primarily occus in reductios, as here. Suppose S < circle EZHQ. Strategy: The goal is to inscribe a figure such that: S < inscribed-figure < circle EZHQ. We do this by steps building a larger and larger figure. The amount a is actually many segments of circle EZHQ, while the figure circle EZHQ - a is a single polygon. Note that each removal must be more than half of the remainder, although theorem X 1 also says that it can be shown that half would be adequate. (diagram 3) And let there be inscribed into circle EZHQ a square, EZHQ. (diagram 4) In fact the inscribed square is larger than half of circle EZHQ, since, in fact, if through points E, Z, H, Q we draw straight-lines touching the circle, square EZHQ is half the square circumscribed about the circle, but the circle is smaller than the circumscribed square. Thus, the inscribed square EZHQ is larger than half circle EZHQ. We inscribe a square and show that it is more than half the circle and so takes away more than half the circle. (diagram 5) Let circular-arcs EZ, ZH, HQ, QE be bisected at points K, L, M, N, and let EK, KZ, ZL, LH, HM, MQ be joined. (diagram 6) Therefore each of triangles EKZ, ZLH, HMQ, QNE is larger than half of the segment of the circle along it, since, in fact, if through points K, L, M, N we draw [straight-lines] touching the circle and fill out the parallelograms on straight-lines EZ, ZH, HQ, QE, each of triangles EKZ, ZLH, HMQ, QNE will be half the parallelogram along it. But the segment along it is smaller than the parallelogram is smaller than the parallelogram. Thus, each of triangles EKZ, ZLH, HMQ, QNE is larger than half the segment of the circle along it. We inscribe a 2n+1-gon and show that the triangles added to the previous 2n-gon to construct the 2n+1-gon are more than half what remains of the circle and so take away more than half the remainder. Bisect the arcs about the squares and form the triangles. The area taken away is more than half. (diagram 7 = 5) In fact, by bisecting the left over circular-arc and joining straight-lines and doing this repeatedly we will leave behind certain segments out of the circle which will be smaller than the excess by which circle EZHQ exceeds region S. For it was shown in the first theorem of the tenth book that when two unequal magnitudes are displayed, if from the larger a larger than half is taken away, and a larger than half of what’s left over, and this repeatedly comes about, there will be left a certain magnitude which will be smaller than the smaller displayed magnitude. And so, it is left, and let the segments on EK, KZ, ZL, LH, HM, MQ, QN, NE of circle EZHQ be smaller than the excess by which circle EZHQ exceeds region S. Therefore a remainder, polygon EKZLHMQN, is larger than region S.
(diagram 8) Let there also be inscribed in circle ABGD a polygon, AXBOGPDR, similar to polygon EKZLHMQN. Therefore, it is: as the square from BD is to the square from ZQ so polygon AXBOGPDR to polygon EKZLHMQN. But as the square from BD to the square from ZQ, so too circle ABGD to region S. Therefore, as circle ABGD is to region S, so too polygon AXBOGPDR to polygon EKZLHMQN. But circle ABGD is larger than the polygon in it. Therefore, region S is also larger than polygon EKZLHMQN. But it is also smaller, which is impossible. Therefore, it is not: as the square from BD to that from ZQ so circle ABGD to some region smaller than circle EZHQ. (diagram 9) In fact, we will similarly show that nor is it: as the square from ZQ to that from BD so circle EZHQ to some region smaller than ABGD. circle EZHQ - the 2n+1-gon < circle EZHQ - S.
Construct a similar 2n+1-gon in circle ABGD. T(BD) : T(ZQ) = circle ABGD : S (by the Hypothesis). the 2n+1-gon in circle ABGD : the 2n+1-gon in circle EZHQ = circle ABGD : S.
S > the 2n+1-gon in circle EZHQ. S < the 2n+1-gon in circle EZHQ (by the construction), which is impossible. Hence, it is not the case that S < circle EZHQ. Strategy: use the assumtion that S > circle EZHQ to show that there must exist another region T, such that T < circle ABCD and circle EZHQ : T = T(QZ) : T(BD), which violates the conclusion of Part 1. (diagram 10) I say, in fact, that nor is it: as the square from BD to that from ZQ so circle ABGD to some region larger than circle EZHQ. For if possible, let it be to a larger, S.
Therefore, inversely, it is: as the square from ZQ to that from DB, so region S to circle ABGD. (diagram 11) But as region S to circle ABGD so circle EZHQ to some region smaller than ABGD. Therefore, as the square from ZQ to that from BD so too circle EZHQ to some region smaller than circle ABGD, which was shown impossible. Therefore, it is not: as the square from BD to that from ZQ so circle ABGD to some region larger than circle EZHQ. But it was shown that nor is it to a smaller. Therefore, it is: as the square from BD to that from ZQ, so circle ABGD to circle EZHQ. Therefore, if similar polygons are inscribed in circles, their ratios are as the squares of the diameters of the circles, just what it was required to show. This was shown false in Part 1. Hence, it is not the case that S > circle EZHQ. Note that Euclid does not conclude that S = circle EZHQ, but only that circle ABGD is to neither a larger nor a smaller than EZHQ, so that it must be to circle EZHQ. I say, in fact, that upon region S being larger than circle EZHQ, as region S is to circle ABGD, so is circle EZHQ to some region smaller than circle ABGD. 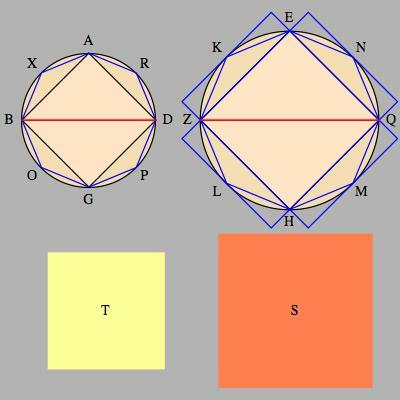 (diagram 12) For let it have come-about as region S is to circle ABGD, so is circle EZHQ to region T. I say that region T is smaller than circle ABGD. For since as region S is to circle ABGD, so is circle EZHQ to region T, alternando as region S is to circle EZHQ, so is circle ABGD to region T. But region S is larger than circle EZHQ. Therefore, circle ABGD is also larger than region T.
Thus, as region S is to circle AMGD, so is circle EZHQ to some region smaller than circle ABGD, just what it was required to show. ⇒ T < circle EZHQ. Use of Elements X 1: let A > B and we construct a series, A, A1, ..., An, ..., such that A1 = A - X1, where 1/2 A < X1 < A, and generally An+1 = An - Xn+1, where 1/2 An < Xn+1 < An. Then we can arrive at an An such that An < B. But note that we also have the series X1, ..., Xn, so that X1 + ... + Xn + An = A. Hence, A - (X1 + ... + Xn) > A - B. In effect, the theorem used might have been better put for the purposes of XII 2, Given one magnitude smaller than another, we can take more than half of the larger magnitude and by accumulating more than half we will arrive at a magnitude larger than the smaller and smaller than the larger. In fact, in the argument of XII 2 the sum X1 + ... + Xn is a polygon inscribed in A. By the assumption of the 4th proportional and the supposition that a : b ≠ c : d, we suppose that a : s = c : d, where s > b or s < b. We suppose that a : s = c : d and s < b. By construction and Elements X 1, we find r such that p, r such that p+r = b and r < b-s. Hence, p = b-r > s.
By construction, we show that there is a q < a such that q : p = c : d, and by the hypothesis c : d = a : s.
Hence q : p = a : s. Since p > s, a > q (Elements V 14). Alternatively, by alternando (V 16), a : q = s : p. Since a > q = s > p (def. of same ratio, V def 5). This is a contradiction. Hence, ~ (s < b). Case 1b: The same argument , just proceeding from b: s= d : c, with s < a, we will show that the assumpition s < a will likewise lead to contradiction. We suppose that a : s = c : d and s > b. By the assumption of the 4th proportional, we find t such that a : s = t : b = c : d or s : a = b : t = d : c. As before, we can deduce that since s > b, by Elements V 14, a > t. Alternatively, by alternando (V 16), a : t = s : b, and, by V def. 5, since s > b, a > t. But now we have b : t = d : c and t < a, which was rule out by Case 1b.This reduces Case 2 to Case 1b. The use of the assumption of the 4th proportional as incorporating the notion that the continuum is connected, i.e. if a : b is a ratio, then a = b ⋁ a < b ⋁ a > b. The close and explicit use of Elements X 1, where in the analysis one would be interested in the infinite sum of the areas taken from b (or approximating b), here it is the quantity of b left after the taking away. The sum of areas taken away only comes in after the application of Elements X 1, namely as the difference between b and the amount of b left. Case 2 is reduced to Case 1 by the awkward introduction of a second quantity and application of the assumption of the 4th proportional.